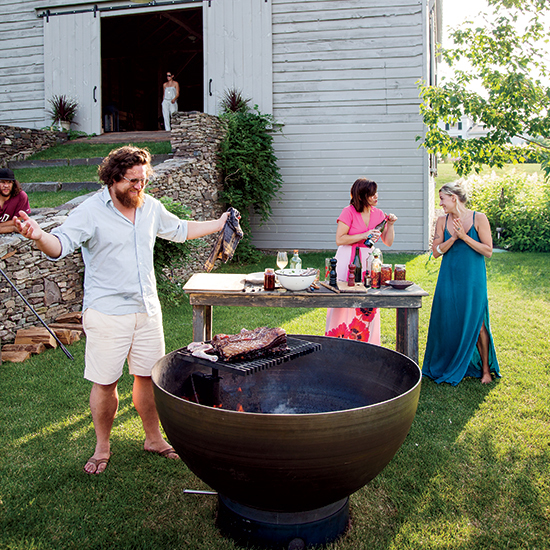 Here, Fish & Game's Zakary Pelaccio shares his best recipes for a summer grilling party. Zakary Pelaccio and Jori Jayne Emde left New York City to pursue a more idyllic life in the Hudson Valley. When the couple have the occasional break from their restaurant, Fish & Game, they host grilling parties—one payoff of all their hands-on work in the garden. Jori Jayne and I lovingly tend the Fish & Game gardens along with an alternating roster of restaurant staff. Our efforts are not in vain, as evidenced by the brilliant colors hiding beneath a canopy of green leaves, soaking in the Hudson Valley sunshine. Although our climate suffers harsher vicissitudes, we share the same latitude as Barcelona, and, come summer, the intensity of the sun reminds us of this geographical kinship. Growing anything outside in the ground is tricky business; there’s no handshake deal with nature. The delicate buds of a cherry tree leave it vulnerable to the whims of weather, so when the orchards around us have a successful harvest, we hop to it. Nature’s unpredictability and the many microclimates of the Hudson Valley are only two of the reasons why, even if we could, we don’t try to grow all that we use in the kitchen at Fish & Game. Yeah, right, what do you think? Starting with deep red-purple cherries, Jori Jayne throws together a sweet-sour, aromatic and flamboyantly colorful salad with thinly sliced spring onions from our garden. For something more substantial, we also serve an allium-intense dish of peas with a spicy kimchi we often make with ramps (spring onions work, too). That kimchi is so alive it would ricochet about your palate were it not mellowed in the salad by the simple, fresh farm cheese from our friend and co-chef Kevin Pomplun. He makes it with the milk from the Dutch Belted cows that are often hanging out about 400 feet away from our outdoor table. These gorgeous, white-striped gals also supply our milk and cream. We turn the milk into yogurt, which, seasoned with a bit of salt, elevates the always satisfying combination of radishes and butter. Yogurt butter has a tang and a silky texture slightly different from cultured butter. But, really, who am I kidding? The pink and red radishes, still cool from the soil, are dynamite all on their own—it’s pure luxury to enhance them at all. Although, isn’t that what we sell in our business? A bit of luxury, an escape provided by a team of (hopefully) talented minds and hands—with the resources and time to take something just that one step further than you might every day.